I’m going to try and save you a little money today. As much as we would love you to call us when you have a heating or air conditioner issue, there is a small checklist you can go over before you call to make sure the problem is not simple and easily remedied. Take a moment before you call anyone to go through this list. If things still do not work, call a repairman. 1. Clogged Air Filter. Having your air filter clogged with dirt is probably one of the most common reasons for unnecessary calls. A plugged air filter can cause your unit to run hard and long, which can cause a lot of issues. By replacing your filter on a monthly basis with an affordable replacement (one that meets requirements can usually be found for just a few dollars) you can keep your heating and air unit running smooth and extend its life. 2. Check Your Thermostat. Just like your smoke detectors and carbon monoxide detectors, the batteries in your digital thermostat need to be changed regularly. If the batteries are dead or dying it can cause your unit to not function properly or not come on at all. If you have trouble finding the batteries, do not hesitate to give us a call. 3. Is The Furnace On? It may seem silly, but make sure that power is being supplied to your heating unit. Check any plugs or fuses that may service your system. 4. Closed Registers. IF you shut down registers in your house to conserve energy in unused rooms, you may be restricting the air flow in your system. Be careful not to close down too many. 5. Blocked Condenser. Look around your unit outdoor and make sure nothing has been stacked against it, or any weeds, leaves, or debris are covering the condenser. 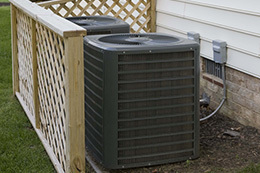 The condenser needs to be unrestricted so the air will flow properly and the system work up to peak efficiency.